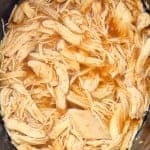 These Slow Cooker Chicken Tacos are super simple to make. Use this simple recipe to make tacos ands so much more. It needs to be part of your regular dinner rotations! Combine the chicken, chicken stock, and taco seasoning in a crock pot. Cook on low for four hours. Shred chicken and serve in tacos.